2006Sea Ray 52Sedan Bridge in Pristine Condition..... OFFERED AT $ 542,900 Its rare when you come across a gem in life... especially a 52' Sedan Bridge like "STEEL AWAY". This one Owner that has been meticulously maintained to the highest level and one look will tell the story. The vessel was just moved down from N.C. and has only 235 Hours on the twin power Cummins QSM-11 with 660 h.p.. with an Onan 13.5 generator with 291 hours. This yacht is equipped with a hydraulic lift and a 2007 11'Boston Whaler with a brand new Mercury 25 hp that is easy dropped in by remote control operation... And That's just the beginning of this luxury yacht. The eye catching Pewter hull has always been Washed every two weeks and Wax every 4 months from day one of ownership. Withthe bridge A/C and fully enclosed new strada glass you can remain comfortable on those hot or cold days. Upgrades / Services / Options * New props installed 2017 ( Also has spare set ) * Full Cummins service on both Engines & Gen set - Feb 2018 * Bottom Job - Feb 2017 * New windshield covers * New smart T.V - has DSS Satellite T.V * All canvas in New condition * All new Upper Station Strada Glass * All Carpets Cleaned - Jan 2018 * New A/C and all A/C's serviced * Bow Thruster * New Outriggers never used * All Service records and manuals are available The Salon is extremely spacious which offer a great entertainment area. The Bose LS48 surround sound system makes you feel like your there. The wood flooring in the galley, solid surface counter tops and stainless steel appliances are comfortable place. What is really nice is the wrap around windows for a truly spectacular dining experience with a panoramic view. This three stateroom two head layout offers all the privacy and comfort one should expect along with all the amenitiesright at your finger tips. The upper station gives you full confidence with all the equipment on the single station which includes a Raymarine colored screen chart plotter, auto pilot, vhf radio, radar, GPS, Smartcraft view system and the Raymarine ST60 Depth display. If your looking for a boat that islike new.... Stop and come take a look atthis lightly used but Highly maintained and appreciated yacht. Owner has bought another boat for his Florida lifestyle. Call Today to See.... THIS IS TRULY A TURN KEY BOAT..... NOTHING TO DO .. EXCEPT GET ON THE WATER FOR ADVENTURES. The Sea Ray 52 Sedan Bridge is so beautifully designed and fully equipped, it's virtually in a class all its own. Outfitted with a fiberglass hardtop, Isenglass enclosure and optional bridge air conditioning, this impressive yacht demands attention wherever it goes. Elegant features include wood flooring, fully adjustable thigh-rise helm seating, master and port staterooms with flatscreen TVs and two full head compartments with separate showers. 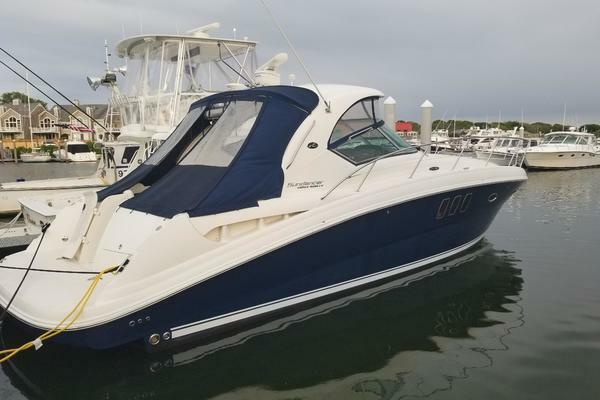 United Yacht Sales New Jersey would love to guide you through a personal showing of this 52' Sea Ray 52 Sedan Bridge 2006. This yacht for sale is located in Naples, Florida and priced at $542,900. For a showing please contact us by filling out the form on this page and we will get back to you shortly!